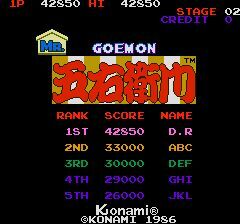 This is a horizontally scrolling platform game in which you must guide Mr Goemon though the levels to reach the end of each stage. 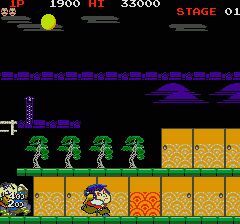 Mr Goemon is armed with his smoking pipe(!) which he can swing left or right to kill his pursuers. When reaching the end of a level he will enjoy a celebratory smoke on his pipe. At the end of some stages there is a pile of gold bars and you can collect one for bonus points. There are various objects scattered across the levels which you can collect. You balance them on your head and can then throw them at the enemies. The object then flies to the edge of the screen in whichever direction you are facing, killing all enemies in its path. 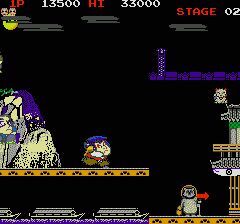 The enemies appear on screen and can jump up and down on the platforms and will try to grab hold of you. If they succeed you must shake them off, by rapidly moving left and right (like Kung Fu Master) because they will strangle you after a few seconds. If you are close to being strangled your face turns purple. There are also large yellow boulders on screen which can be pushed by running into them. The boulder rolls across the screen killing all enemies in its path. There is also a golden flashing hammer which when collected acts like a Pacman powerpill. You are invincible for a few seconds and can kill the enemies simply by running into them for points. As well as the platforms, some parts of some of the levels are water based and there are connected boats which you can walk across. Hoever, some areas are open water and you must avoid these as you will fall in and drown, causing you to lose a life. As well as the warriors chasing you, you also encounter harder enemies in the form of Ninja and also large flying creatures which are impervious to your "head-based" weapon. You have to get in close and hit them with your pipe to kill them. On later levels, the warriors also have the ability to throw various weapons at you, which must be avoided as they cannot be destroyed. 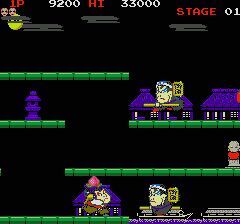 You can make the warriors drop down a platform by jumping on their heads from above, and if they are already on the bottom platform they fall off the bottom of the screen for no score. You can also make them bounce up into the air by jumping at them from below. Each level is played against the clock, shown by the sun moving across the sky, and you must reach the end of the level before the sun crosses to the right hand side. At the end of each stage you are awarded bonus points for however much time is remaining. You start the game with 3 lives and extras are awarded for 20,000 points and every 60,000 points. Scoring Collecting a weapon: 100 points. Killing a warrior: 200 points. Killing a second warrior: 400 points. Killing a third warrior: 800 points. Warriors when powered up: 800 points each. Killing a flying boss: 1,600 points. Collecting a gold bar at the end of a level :800-4,000 points. Warriors can only fire at you when on a platform, so bouncing them up into the air is useful to prevent them firing. When you collect a golden hammer keep running right, and warriors will keep appearing and running into you for 800 points each. If you are faced with several warriors, bounce a few off the bottom of the screen to get them out of your way. Try not to use the last "head weapon" you collect, as you can carry it forward to the next stage. It's very useful to start a stage already armed. I think when collecting the gold bars if you jump to try to get the furthest to the right, it is worth a higher score.